Heel pain often results from improper arch support and misalignment of your heel and forefoot as you walk. When this happens, feet can hit the ground off balance, causing ankles to roll inward, pulling your entire lower body out of alignment. The Dr Foot Work Insoles are designed specifically to fit into work boots and shoes. These dynamically engineered functional insoles correct alignment of the foot & ankle providing comfort and relief for people who are on their feet all day. The special poron heel cushion and the comfortable arch support helps to reduce shock absorption and fatigue. 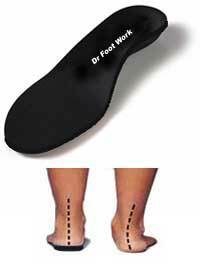 Heel pain occurs when there is poor alignment of the feet. Dr Foot's Work Insoles treats the underlying cause of heel pain and provides comfort and relief for patients.